I don’t even know their names. Yet they are a couple whose story I will never forget. 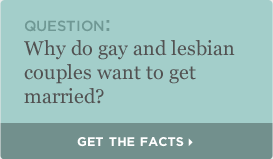 And their story helped propel me to fight full-time for the freedom to marry for all loving couples in America. In 2004, as ill-conceived measures to “defend” marriage were placed on ballots of states across the country, I was one of many straight allies working on a campaign in my home state of Oregon. A volunteer canvasser knocked the door of a suburban house, and the gay man who lived there stood at the doorway and explained what had happened to him. I never knew their names, but for the sake of this story, let’s call them Bob and Timothy. 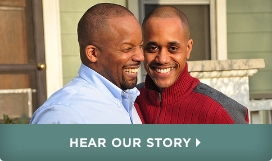 They had been together for many years when Timothy was diagnosed with cancer. Bob accompanied Timothy to his many treatments, driving him back and forth and staying by his side through the chemo, and the many other challenges that accompany a life-threatening diagnosis. Timothy’s health worsened, until late one night when Bob had to call an ambulance because Timothy was extremely ill. Timothy was admitted into intensive care — and Bob was not allowed by his partner’s bedside. Out in the waiting room, Bob was told that Timothy would likely not make it through the night, but still the hospital would not let him sit vigil by his beloved’s bedside. As Bob begged and negotiated with hospital staff, they told him he would need to prove that he and Timothy had indeed lived together as a couple for the many years he had described. The staff finally decreed that if Bob could produce several neighbors who would come to the hospital and vouch for the fact that the couple had lived in the neighborhood for a significant period of time, then Bob would be allowed into the intensive care ward. That’s the image that got to me and was seared into my mind — the idea that a man was forced to go knocking on his neighbors’ doors in the middle of the night, to somehow coax them out of their beds, convince them to get dressed and make the trip to the hospital — all to vouch for the fact that their gay neighbors were indeed a loving and committed couple. To prove that they were a family. That story simply broke my heart. On one of the worst nights of his life, the fact that any human being should be sent out on such a desperate mission, racing to prove the value of their relationship while his beloved’s life ticked away. That just seemed so wrong. And I decided to do everything in my power to make it right.